Your Choice: 1 x Black & 1 x White Of Skinny Patent Leather Belts With Gold Solid Color Plaque Buckle. ❤ Outside Patent Leather, Inside Soft Genuine Leather, Quick Release Belt Buckle, Interlocking Plaque Alloy Buckle. ❤ Multiple Color Are Available, Belt Size Fit Up To Waist 36 Inch, Belt Width 0.39 Inch. 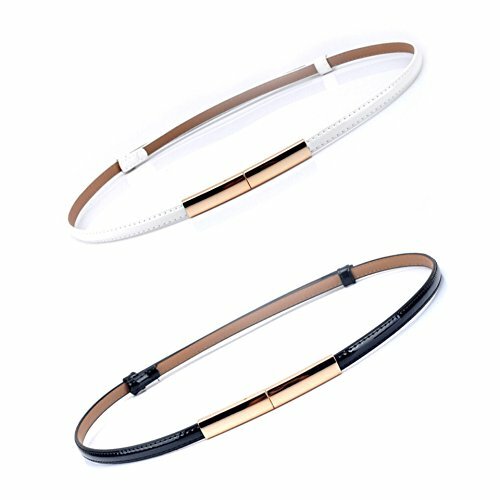 ❤ Elegance Belt Design, Timeless In Classic Style, Perfect Belt Accessory To Shape Your Waist, Great With The Blouse, Dress, Skirt, Pants. ❤ Flexible Adjustable Size Allow You Use For Different Thicknesses Clothes. Your Satisfaction Are Very Important For Us. We Strive To Offer You The Best Value & Service Possible. Please Let Me Know If You Have Any Issue About Our Products, Our Team Will Provide The Best Service To You. Item Will Ship Within 1 Business Day After Confirmation Of Payment. Any Order Received During The Weekend Or On Any Public Holidays Will Ship The Following Business Day. CaserBay Currently Does Not Authorize Other Sellers On Amazon Sells The CaserBay Brand Products, Only Sold By CaserBay. ❤ By CaserBay Package Contents, Your Choice: 1 x Black & 1 x White Of Skinny Patent Leather Belts With Gold Solid Color Plaque Buckle. If you have any questions about this product by CaserBay, contact us by completing and submitting the form below. If you are looking for a specif part number, please include it with your message.